The church is currently prayerfully considering its future direction and ministry. Desford like most Baptist Churches has a team of Deacons, they are elected by the Membership of the Church and are involved in the leadership and day to day running of the Church. Deacons are answerable to the Membership and report back to them at our regular Members' meetings, which also provide good opportunities to meet together to pray about matters concerning the Church. Our deacons have a wide variety of backgrounds from banking, publishing and social care to engineering and education. We have also lived in various parts of the country and abroad. We all have a heart for building up our fellowship and sharing the good news of Jesus here in our community. 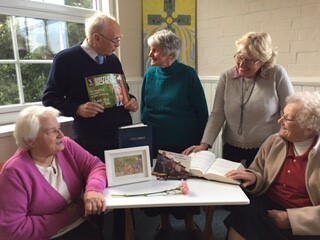 Four Church Members form the current Secretarial Team. Of course, many people are involved in the successful running of a Church and Desford is blessed with people who give their time to activities such as Music, leading Youth and Children's Groups, Hospitality and Catering, Church Publicity and Planning and Evangelism and Prayer.